When SHTF, getting out of Dodge is usually a good idea; but what it’s just not possible? 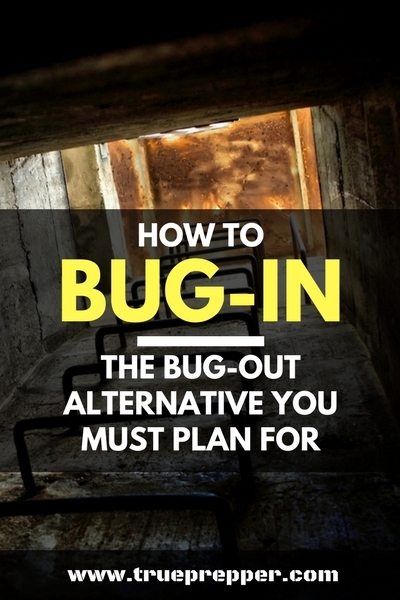 The Bug-In plan is a solid preparation tool for the worst scenarios you could conceive. It involves plenty of forethought, supplies, and staying informed. Bugging-in is not a reaction to an event, but it is the result of months or even years of preparation. It is very different from bugging out, although both plans are deeply rooted in prepping. Space – You can only store what you can fit. Shelving and storage solutions can help you fit more. Cost – Although preppers love free stuff, (see our free ebook listing) most resources cost good, hard earned money. Intent – You can have all the room and the money in the world, but if you don’t have any drive to be ready for SHTF, you probably aren’t going to have too many resources available. It takes prior planning and more than a few thoughts to get prepared for most contingency situations. Work with what you have, and know that intent is the factor you can control now. Preppers in tiny apartments and trailers with low income jobs have effectively prepared with up to 10 years of bug-in supplies. What’s your excuse? What Threats Will Require You to Bug-In? You may be saying to yourself “Wait, I am definitely planning on bugging out during a nuclear attack.” Sure, that’s a good plan; but what is the notification time on one of those? Can you get to your bug out location within 20 minutes? If not, having a bug in plan even to hold you over until you can actually bug out to your alternate location is a good idea. With many of these situations, the worse place you could be caught at the height of the incident is on the road. That includes many more, such as hurricanes and floods- but those usually provide plenty of notice for evacuation. Shelter – Having a solid shelter to weather storms, attacks, and incidents is very important. If you have multiple rooms, identify the room you want to become your main shelter room. HQ, bunker, safe room- whatever you want to call it, this should be where your supplies are kept. It should be big enough to house everyone in your family, and if not you may need to get creative with shelving or lofts. You should also have your survival kit in your identified shelter room. Survival Kit – We have a whole separate section on this. The kit has basic necessities, but scalable supplies for food and water so you can survive for longer periods. Specialty kits can be added for elevated threats in your area, such as nuclear accidents or earthquakes. Information – How we get information during catastrophic events can make the difference between life and death. If you don’t get notified of an inbound nuclear attack, how much good does an underground bunker do you? Staying informed is something that most preppers work on each and every day. Besides learning new prepping tips and techniques, just keeping up to date on current events is a good idea. Going past the current events and learning about early warning systems is an even better idea. Action Plan – All of the gear you could ever want, combined with a large arsenal in a missile silo is useless without a plan. Luckily, this is easy to fix. We have a free emergency action plan template that is easily adopted for a bug-in scenario if you are just getting started with prepping. This post will break down how to fill out the EAP, or you can just jump straight to the template. Get Home Bag – A “GHB” or get home bag is similar to a bug out bag, but it is for getting you back to your supplies at home. Most of us commute some distance to work or leave the home often for some other reason. The possibility of an emergency or disaster doesn’t just go away when you leave your threshold. In many cases, it is even more likely when you are away during the day at work. Check out our Get Home Bag guide so you can get home safely. The age old prepping question is “are you planning to bug-in or bug-out when SHTF?” I hate this question. Why polarize two equally productive plans just for the sake of argument? Most times, one prepper will say “I’m headed off-grid to my Bug Out Location” and the other guy will say “I’m stocked for 15 years in place”. The best question is “Why aren’t you prepared for both?” We’ve seen that there is never a single good answer for all of the possible events that could happen. Bugging out is better in some situations, and hunkering down is better in others. Don’t subscribe to one brand of prepping- be prepared for it all. 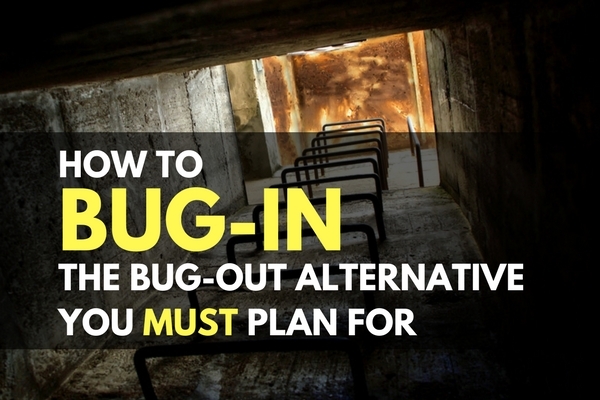 A bug-in plan is easier than it sounds. It can be as involved and complicated as you want it to be or you can just keep it simple. The bottom line is: we encourage everyone to at least have a plan. We hope you’ve learned what ‘bugging-in’ is, how to bug-in, and will consider developing a plan if you haven’t already. Keep exploring, stay prepared, and be safe. Both plans are important. Don’t put all your eggs in one basket!